Last week we talked about purging tasks so we could concentrate on just a few pieces of work, on the theory that productivity improves when we can focus our attention on just a few things. But when there are so many things that seem to need to be done, how do we decide what to purge so our attention isn't being diverted all over the place? Life, including work life, is in flux. What tasks we can purge will keep changing, depending on our situation at any particular moment. Are we under contract for a book, under deadline for an edit for a publication, or have a workshop commitment coming up? Are we starting a new project? Are we working a day job, full-time, part-time, or some other kind of time? Is our personal life intruding into our professional life because of a family member's illness, surgery, life change? Everything always comes back to Situational Time Management. Assessing our situation so we can determine what tasks we can limit ourselves to will determine what tasks we can purge. In medicine, the minimum effective dose is the lowest dose of a medicine that gets you the result you need. Taking more than you need either doesn't improve things or has the potential to make your condition worse. In terms of productivity, the theory goes that you can find a minimum effective dose--or the minimum amount of time/effort--needed to get the work result you want or require. Well, take a blogger/writer, for instance. Writers need to be careful about blogging. Blogs have value, but writers have to be careful not to commit too much of their work time to them. So what is the minimum effective blogging schedule? This will be different for every writer. When I first started blogging, my goal was three posts a week. Then I got into the childlit blogging world and was blogging like mad. For quite some time, I've been trying to cut back to three times a week, but I'm always stumbling upon something more I want to blog about. So I'm cutting down to two, with the expectation that some weeks I'll do more. The MED for blog reader responses--It's not necessary for me to do a full post about every single book I read. When I post at Goodreads (which I like to do so someone is keeping track of how many books I read over a year), it's not even necessary for me to do more than a star rating. The What Did You Do This Week? posts were fantastic for me as far as getting marketing done. But if I'm only going to do two posts a week, that sure doesn't need to be one of them. We're talking about the MED for a situation in which I'm generating new work. If I were in a situation in which I was marketing a new book, I might want to spend more time blogging and promoting the blog as part of a marketing plan for a book. A nonblogging example--You're in a situation in which your professional time is cut down because of demands of a day job or an increase in family responsibilities. What is the minimum effective dose of work you need to do to keep your mind in a big writing project you've started so you can pick up quickly when your situation changes? A couple of pages a week? Reading over some of your completed draft each day looking for potential changes you can make notes on? Some research? Pay attention to what kinds of results you're getting for various tasks so you can avoid continuing doing things that aren't helping you much just because you've been doing them in the past or because conventional wisdom says you should do them. Marketing is an area where I often see writers assess and purge tasks. I've heard a few writers who have done blog tours in the past question whether they will do one for their next book. Blog tours are very labor intensive for writers because in addition to the soul-sucking chore of finding blogs to take part, there are often guest posts to write or interview questions to answer. It's difficult to determine a writer's return on investment for these things. I spoke with a writer this past year who was cutting back on store appearances. They involve time to set up, travel time, and the time in the store and can result in only a handful of people showing up and even fewer sales. Even though conventional wisdom suggests it's good to network with booksellers, the return on investment for these activities is difficult to determine. For myself, I had a goal this year involving a new marketing push for Saving the Planet & Stuff. Given the return on investment of my marketing efforts in the past and some family issues that will require extra attention this year, I've decided to let that goal go in favor of spending my time on generating new work and submitting material. Networking is another area where writers can assess what kinds of results they're getting for their efforts and whether or not some purging can be done there. How valuable is attending writing conferences to you? Are you getting a good return on investment time with pitching and teaching writing workshops? 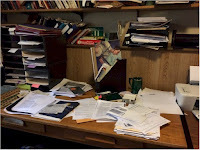 Most of the material I read relating to cutting down on work in order to increase productivity suggested it as a way of dealing with feeling overwhelmed. Personally, I'd like to avoid being overwhelmed in the first place. Remember, we're making our purge decisions based upon the needs of our present situation. When our situation changes, we can pick up purged tasks again and purge something else. What tasks can you purge so that you can increase your productivity by doing less?